I designed this card for Lizzie Anne Designs, and it is the featured here, for the July Card of the Month! When I saw the open line starfish it reminded me of a sand dollar! Im glad I made this a while ago and can share with you now cause I obviously havent inked a stamp in a week or so, and Im going through with-drawls. Here is the info. Hope you enjoy and try it on your own! Paper: Vellum, Cool Caribbean, Sky Blue, and Kraft Cardstock- Stampin’ Up! 1) Using large starfish image, stamp onto vellum cardstock using white StazOn. 2) Make sure it is dry, then turn image over to back. Place on mouse pad or piercing mat. 3) Use embossing stylus, trace stamped image. 4) Use paper piercer and pierce the circle in the star center. 5) Trim out star image with paper snips-not in a perfect circle. 2) Rip the top of a layer of sky blue and sponge edges in white StazOn. Adhere to bottom of card. 3) Rip the top of a layer in Caribbean blue cardstock, making sure it is smaller than Sky blue, then sponge edges with white stazon. Adhere to bottom of card. 4) Repeat above instructions for vellum layer. Attach with vellum dots adhesive (so you cannot see it). 5) Using speckled sand image, randomly stamp across top of card using the Glue Pad. 6) Sprinkle brown glitter over card. It will stick to the “sand”. 7) Tie on organdy ribbon and hemp. Cut excess ribbon. 8) Using Sahara Sand ink, stamp solid starfish onto card 1/2 in “water”. 9) Stamp sentiment twice (if you want dimension to the sentiment) using first white StazOn (let dry) then in Sahara Sand ink. A stamp-a-ma-jig would be helpful doing this. 12 Responses for "Faux Sand Dollar"
Great idea on the sand dollar! Thanks for the tutorial. WOW! Stunning card; I *love* it!! 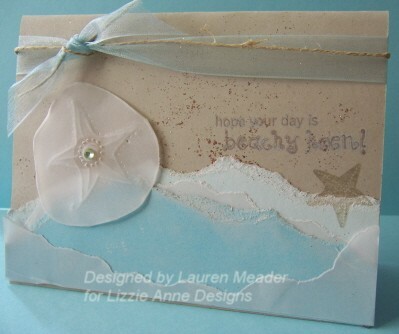 what a pretty card…and awesome idea for the sand dollar…how creative! This is gorgeous! Thanks for the directions. WOW…not much else I can say! Beautifully done, can totally see why it would be chosen as the card of the month! Absolutely love this card. I am a california beach girl so I love anything that has to do with the beach. I am going to have to order this set it is absolutely gorgeous. Thanks for sharing the tutorial with us. Absolutely stunning. You are so creative…I am in awe of your ability to think of new and beautiful stamping images. Well done. Cool design, I enjoy this design very much and will try it on my own. Thank you.